I’ve only been to Cheltenham a few times in my life but each time it seems to grow on me a little more. I think it’s a pretty well kept secret, even from us Brits, as to it’s beauty, architecture, lifestyle and many events and celebrations. Wikipedia lists it as – Cheltenham ( /ˈtʃɛltnəm/), also known as Cheltenham Spa, is a large spa town and borough in Gloucestershire, England, located on the edge of the Cotswolds. It is the home of the flagship race of British steeplechase horse racing, the Gold Cup, the main event of the Cheltenham Festival held every March. The town hosts several festivals of culture often featuring nationally and internationally famous contributors and attendees, including Cheltenham Literature Festival, Cheltenham Jazz Festival, Cheltenham Science Festival and Cheltenham Music Festival. Gosh doesn’t that all sound so sensible? Even the architecture looks grown up! 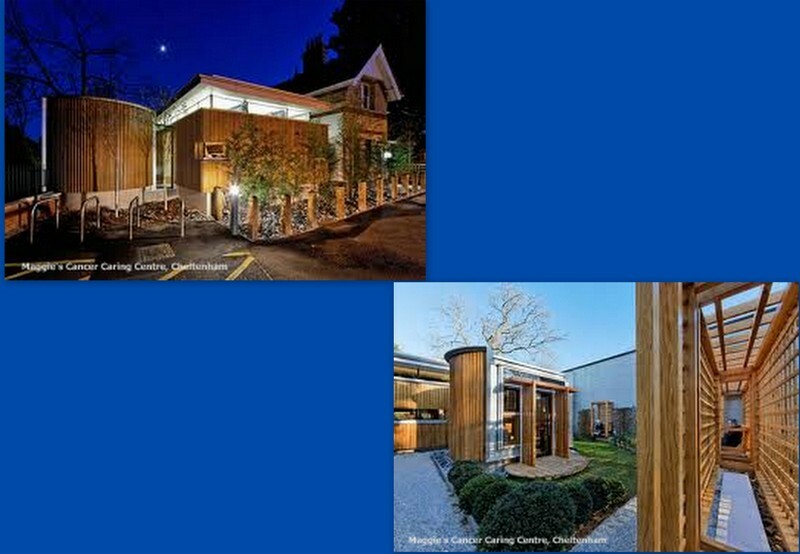 There’s even a Maggie’s Cancer Caring Centre in Cheltenham… and that too looks like a cool building. Hehehe those of you who know me well know that I’m a fan of architecture. You also know that when I’m visiting new towns or cities I often end up with black eyes… no, not because I’m out running (hahaha), but because I’ve got my nose in the air looking up and come a-cropper with uneven pave stones, signposts or bollards! So despite my tongue in cheek comments, I’m quite at home in Cheltenham looking at the architecture, the town design, sculptures and garden landscaping. 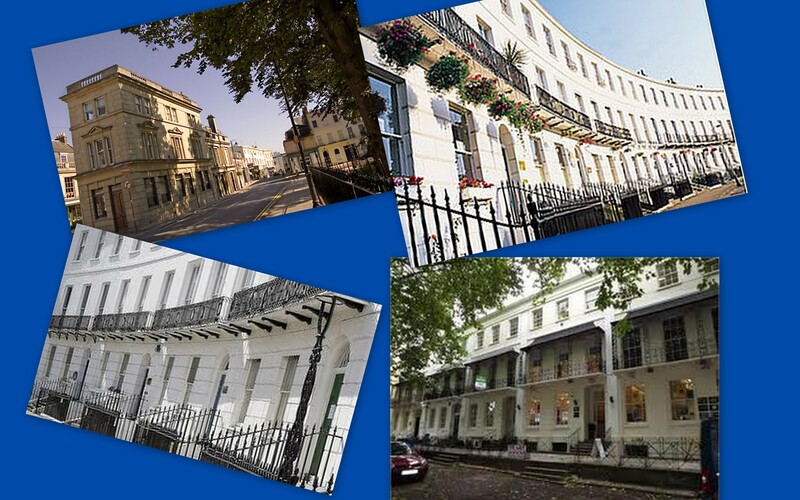 There’s lots of space, lots of history and lots of well maintained areas that must make the people of Cheltenham very proud to live there. I think I’ve got my eye on the 2013 Jazz Festival… hmmm May next year! Who’s joining me? Truly if you’re in the UK and want somewhere to explore, do think about visiting Cheltenham. However for all the ‘cultural’ comments above I have to ‘fess that there wasn’t a great deal of culture surrounding this weekend’s visit… but then again there wasn’t really meant to be either! PJ who used to be a neighbour of ours in Sydney is currently in the UK visiting friends and family. He isn’t from Cheltenham, his family are in Essex. However some years ago, he stayed with friends in Cheltenham for a weekend and by the end of the weekend, had a job and then stayed there for 3 years, in their basement!… I can so understand how this might happen too! Cheltenham does have that draw for me too! So this weekend I discovered a new part of Cheltenham. One that doesn’t appear in Wikipedia. The 40-somethings that are still out to party! I suspect however that in ‘real life’ there may be less going out and partying and more responsibility and childcare. But it’s great to see that there’s still a good group of PJ’s friends who get together when he’s in the UK and let (what remains of) their hair down! 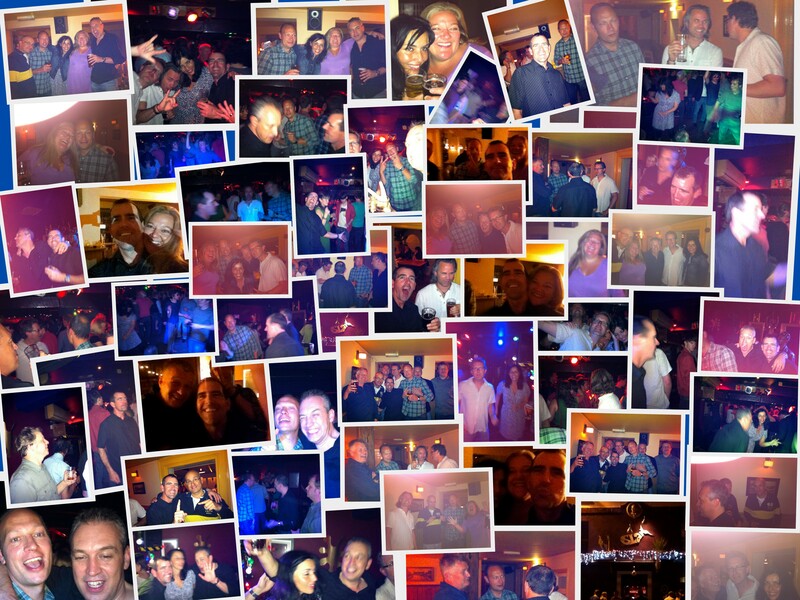 I think I’ll let the photos explain the evening… err except to say bourbon and coke and still in a club at 3am! Loved it. Fabulous evening. Great bunch of people. Lots of laughter. Beautiful town. Hmmm maybe I should move to Cheltenham? This entry was posted in Living, Support and tagged Maggie's by AnnaGoAnna. Bookmark the permalink. Thanks. So pleased you made it out on Sunday lunch time. As a Hotels Gloucestershire, Cheltenham is a great place to send our guests as there is always something exciting happening, and many cultural festivals go on throughout the year.